Building 1 is a Self catering property with 7 private bedrooms. 2 X 4 single bedded rooms with one room having bunk beds in the room. 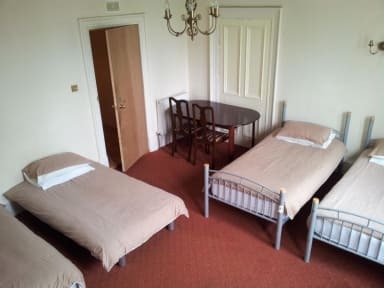 1 X 3 bedded room with 3 single beds in the room. Building 2 (Annex ) which is next door at Number 9 has 2 more luxurious private rooms for 4 people in each with a double bed and a bunk bed in each room. One room (room 1) has En-suite facilities and the other room (Room 2) has private bathroom facilities. There is a shared self catering kitchen available. Gas central heating and electric heating in both properties have self catering kitchens. There are some private and shared bathrooms available in both properties. The apartments have self catering facilities with free tea and coffee and some laundry facilities. There is no private parking but there is a car park 2 minutes walk away where it free to park from 6pm to 8am next morning. Out with these hours parking will need to be paid for. Both buildings is located just off the city centre of Inverness behind the main high street up Market Brae steps to the left 20 meters on the right. 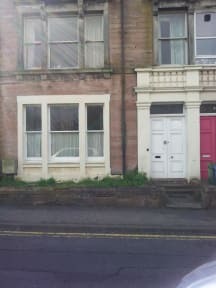 The property is located just around the city center in the crown and haugh areas of Inverness 5 mins walk from the bus and train station. We are close to the Eastgate shopping centre and Marks and Spencers and is near the famous Eden Court Theatre. The Northern Meeting Park, where music concerts are held, is only a 5 to 10 min walk away. Check-in from 3pm to 11pm. Early check in may be available but guest must contact the hostel beforehand to see if its possible. Details can be given to guests that book room prior to their arrival if required . ask for details. We prefer cash for payment but we do accept payment by cash, debit & credit card. There is a 3% transaction fee for payments made by card and is transacted through our sister business The Struy Guest House. PAYMENTS MUST BE MADE ON ARRIVAL TO THE PREMISES SO PLEASE ARRANGE IF PAYING BY CASH. Breakfast is not available or included at these properties. Towels are available if required for hire at £1 per towel.